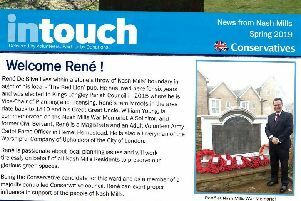 René Leonard Neville De Silva is hoping to be elected to Dacorum Borough Council next month. But the Gazette has revealed that Mr De Silva was fined £12,500 last year for his role in “misappropriating client money” in his job as a partner in a solicitors firm. A tribunal was brought by the Solicitors Disciplinary Tribunal (SDT) last year, with the panel concluding that Mr De Silva and his colleagues had “turned a blind eye to risk,” and “had clearly been reckless”. Mr Silva refused to speak to the Gazette when he was called by our team this week, while calls to the constituency party agent, local party chairman, and the leader of the party at Dacorum Borough Council, all went unanswered. But in a letter later sent to the Gazette, association chairman Mark Woods described the allegations as a character assassination. Mr Woods said: “René is a solicitor and did make a mistake in his professional capacity in that the solicitor’s firm he worked for employed a bookkeeper who transferred money between the firm’s accounts inappropriately. Mr Woods did return calls from the Gazette, but in a Facebook post he also wrote that the allegations were a sign of “low desperation”. Local Conservative leaders, and Mr De Silva, were all again unavailable for comment today.